Well, I’m sure many of you have already heard or are witness to the “Blizzard 2014” going on here in the Midwest. We’re snowed in and it’s frightfully freezing outside. So, I haven’t been to the gym in 2 days and I didn’t make it to work today, so I thought I’d share another one of my New Year’s Resolutions with you. I’m going to elaborate on the little baby steps I’ve been making to save money in order to pay off bills this year. I’ve been doing them for the past 3 months, again getting a head start for the new year. I have started extreme couponing, doing surveys for cash, and I use all of these nifty apps on my IPhone to save money and download coupons. I will say that I didn’t just come up with this idea on my own. A dear friend of mine at work started last year paying off all of his debt and saving money and he has worked miracles on his credit score. He introduced me to the Krazycouponlady.com, the paid surveys, and all of the money saving apps. Let me tell you about www.krazycouponlady.com, it’s a website that is run by two ladies that know a thing or two about saving money. They have a daily blog where they tell you about all of these great deals at stores and online, and they tell you about which coupons to use, which insert a coupon will be in, and what store will have the best deals. I cut coupons like a crazy person and when I have the extra money I stock up on necessities, like shampoo, soap, deodorant, toothpaste, and paper products. I don’t however buy things that I don’t need and I don’t purchase items just because I have a coupon. They have this coupon binder that I’ve downloaded and use for my coupons, but I firmly believe in not buying just because you have a coupon. So a lot of my coupons go unused if I don’t really, really, need it. Because, again I’m trying to save money, not waste it on unnecessary things. Drop by their site, it’s very cool and it will teach you a lot about couponing. And then I have all of these cool apps that I use on my phone that pay me either to buy things that I’m already shopping for or visiting stores. Like Shopkick, OMG I love this app! I think this is one of THE best apps that I have (even better than Candy Crush, Yeah, I said it). With Shopkick, they award you “kicks” (points) for stopping by your local stores, walking in, and scanning certain items. Most of the time they just award you kicks just for walking in a store and that’s it. Then you collect as many kicks as you like and you can redeem them for a lot of great things like gift cards, gas cards, merchandise, and you can even donate your kicks to a charity. I ABSOLUTELY LOVE IT! I have cashed in on over $100 worth of gift cards at Target. That’s all I ever use my kicks for, because I’m a Target-holic, you guys know what I mean. I live literally around the corner from a Target and I could get kicks everyday, if I wanted to, and believe me sometimes I do. Don’t judge (ok, you can judge, but it won’t stop my addiction to Target). But, definitely download the Shopkick app, if you haven’t already. Better yet, use my referral link, because every person you refer and they sign up for it you collect 50% of their kicks for 2 weeks. You don’t take their kicks, Shopkick just matches your friends kicks up to 50% for a 2 week period. You’ll thank me later!!! AND, speaking of Target!!! I know you Targeteers, know about their RedCard and the 5% savings you get whenever you buy something and the free shipping with every online purchase. I know, I know, you’re thinking girl didn’t you hear about the theft of people’s Redcard and personal info from Target a couple of months ago? Yes, I know, and yes I shopped during that time period, but I check my bank account daily, just to make sure no funny business is going on and I assure you no one is out there buying Beats by Dre headphones, or 20 gallons of Edy’s ice cream with my card. And I hope you know about the Cartwheel app from Target that gives you additional deals at their stores. So, you can save money on a Target shopping spree with coupons, Target Mobile coupons (Target app), the Cartwheel app, and the Redcard!!!! Try it and see how much you save. You’re welcome in advance. I also use Receipt Hog, which is an app that gives you points for taking pics of your receipts at grocery stores. I will say that it takes FOREVER to collect points, but I feel like I’ve invested so much time in it, that I’ll stick with it until I collect enough points for a cash out option or an Amazon gift card. Another app that gives you points for going to certain movie theaters and restaurants is Plink. It gives you points for checking in at certain retailers and spending a certain amount of money there, as well. Several apps that I use to get coupons are SavingStar, Coupons.com, and Google Offers. I use Favado because it’s just like Krazycouponlady.com because it shows you all of the local sales in your area and it tells you which coupons to use and which insert that the coupon came in to get the best deal. And the ever wonderful Groupon app that has great deals for everything from merchandise, restaurant deals, and vacation packages. It’s where I snagged the great deal on my boxing classes that I will be taking soon. 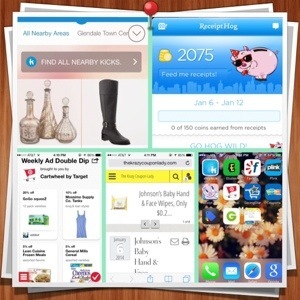 So, not only do I use all of these apps before I go shopping, I’m making a list and checking it twice, and I have my coupons in hand before I even get to the store. Plan and be prepared so there is no impulsive buying, like that 20 gallons of Edy’s ice cream. Stop by tomorrow and we’ll talk about the Survey sites that I use to earn extra cash or hopefully tomorrow will be a Gym day, because I’m going back to work, hopefully.